to receive PlaneTalk 10 times per year. We will never sell or share your address, and very rarely email anything else to you. PlaneTree Health Library is not responsible for the content on web sites accessed from our site; each originating organization has sole responsibility for its web pages. Health and medical information accessed through these websites is not intended to substitute for or replace the advice or instruction of a health care professional. Please discuss the information with your health care providers. 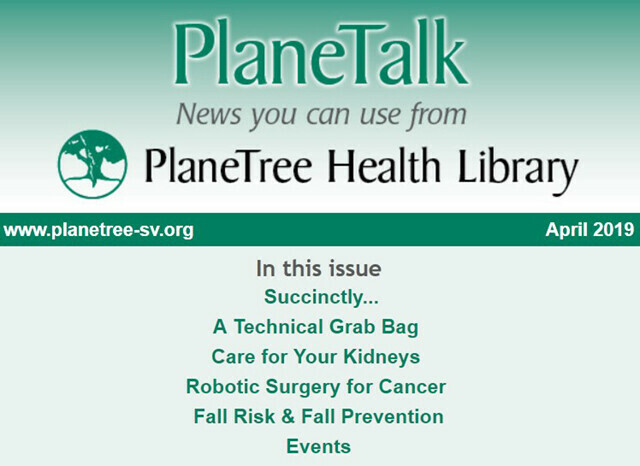 PlaneTree Health Library, located in Santa Clara County, California, has provided free health information services to the public since 1989. We are an independent 501(c)(3) nonprofit organization. Please support our work.